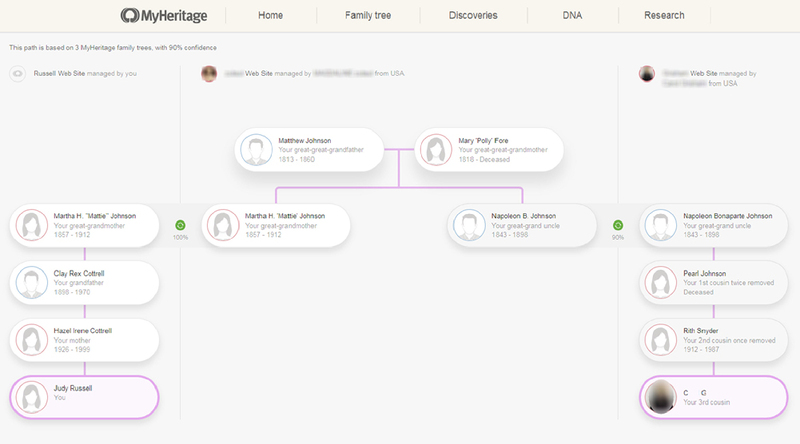 As RootsTech continues in Salt Lake City, MyHeritage DNA has joined in the fun of major announcements by launching its Theory of Family Relativity — a DNA matching analysis tool that uses family trees and records to suggest ways in which two DNA test takers may match each other, and a second new tool integrating autoclustering into its results. First, the Theory of Family Relativity feature. What this tool does is integrate genealogical information from all the MyHeritage collections of historical records and family tree profiles, to offer theories on how DNA Matches might be related. So instead of having your tree matched only against a matches’ tree to see where the link might be, this system crawls through records and other trees to see if a link can be found. My great grandmother Martha “Mattie” Johnson in my tree is a match to her entry in another tree at MyHeritage, and the entry in that tree for her brother Napoleon Bonaparte Johnson1 matches the great grandfather of my DNA match in her tree. I can then look for records — and find them — to verify this proposed relationship. I can find Lotta Pearl Johnson as a daughter of Napoleon Bonaparte Johnson, and her marriage to a man named Sydner, and her daughter Ruth (not Rith2) marrying a man with the surname of my match, and a birth index record for the match herself. The links in any given case can be family trees or census records or newspaper articles or more. 1. Only kits that tested or uploaded before November 2018 have Theory of Family Relativity entries. Others coming online later will have to wait for the database to be re-run against the records. 2. The system is heavily weighted towards family trees; none of my entries linked through even so much as a census record. 3. As with all other tools of this nature, the bigger and more-well-documented a family tree is, the better the results. And you can access it, if there are theories for your test kit, right from the DNA Matches tab of your DNA results — there’s a pinkish-colored link at the top to click on that will filter your results to only those matches where you have a Theory of Family Relativity. And then patience is in order. I tried this tool this morning, and am still waiting for the email telling me my results are available. You can see a representation of the results you’ll get on the right in the image above — and I’ve used this tool at Evert-Jan Blom’s GeneticAffairs.com website, however, so I know what to expect. It really is a wonderful way of visualizing your matches in groups that may help point you to where in your family tree a particular match may belong. Cite/link to this post: Judy G. Russell, “New MyHeritage DNA tools,” The Legal Genealogist (https://www.legalgenealogist.com/blog : posted 28 Feb 2019). I’m disappointed that my dna doesn’t show even though I had uploaded it. I’m not a paying member right now, maybe that’s why. If you uploaded after 11/1/2018, you won’t see these Theory things yet. I uploaded before then. I don’t even see that they have my dna. That’s something you’ll have to take up with MyHeritage, I’m afraid. Wow — The Theory of Family Relativity tool looks like it will be a great time-saver. It took about one minute to point out an exact location for each of agroup of three cousins on the exact branch of the family tree where we suspected the shared ancestral couple must be, finding its way through five different user supplied family trees. Even though it didn’t appear to consult censusreturns or other documentary evidence, it provided a pretty clear road map to use as a research guide. This should save us a lot of time that might otherwise be lost blundering down numerous dead ends. As long as everyone understands all of these are HINTS, and not proven facts, we’ll all save time (I hope!). One thing we can all do to help reduce the viral spread of poorly researched misinformation is to start posting the correct information on popular sites like FamilySearch.org and Wikipedia.com, along with supporting evidence from freely available documents and records and engage (very politely and respectfully) through the sites’ messaging systems with other who may disagree with us. Like many others, I used to have concerns about giving away the results of many years’ hard work and having it “stolen” (i.e. used or abused by some lazy stranger who might republish it all under his or her own name without so much as a thank you). But after seeing the hash a group of well-meaning people who didn’t know any better had managed to make out of my 3xggranparents’ family because they were missing key pieces of evidence that were not yet available on line, I realized that i needed to set the record straight. It took several months of going through three generations of the family and relinking everyone to the correct parents and spouses, writing mini proof arguments and explanations in the biographical sections, and communicating with other researchers who had contributed the erroneous info, but that family tree is now stable, and the information that is spreading virally over the web is now based on solid evidence, even if those who are spreading it don’t bother to read or copy the source citations. Best of all, along the way I’ve been privileged to exchange notes with some of the nicest, kindest people anyone could ever hope to meet and to learn from some of the smartest, most experienced and dedicated genealogists around. I have been rewarded many times over and above anything I deserve and no longer worry about anyone “stealing” my work, just as long as they get the details right. Talk about spreading misinformation — the references to FAmilySearchorg and Wikipedia.com should have been to the FamilySearch.org Family Tree and WikiTree.com. Interesting concept but out of about 10 Theory of Relativity, more than 50% where indicating incorrect second wives or descendants with incorrect surnames. I think it needs some more work to be very useful. I’m also waiting for the email saying my autocluster report is ready, a week now. It seems that either 1) the tool is not working or 2) MyHeritage don’t have the processing power to cover the new requests. Commons sense suggests that they should take it down until they’ve fixed it.